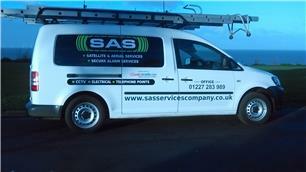 SAS Services - Alarms/Security, TV Aerials/Satellite Services based in Herne Bay, Kent. Are you looking for reliable aerial experts in Herne Bay and surrounding areas? Look no further than SAS Services. We have a team of highly skilled and reliable engineers delivering prompt and quality solutions that meet all your requirements. All our engineers are City & Guilds certified and registered with the Disclosure and Barring Services (formerly CRB checks).